The grocery store has an entire aisle dedicated to oils, and cooking oils wax and wane in popularity. Remember when everyone thought margarine was better than better? (Hint: it’s not.) And coconut oil was all over the news for its alleged health benefits; some celebrities were even using it to whiten their teeth. 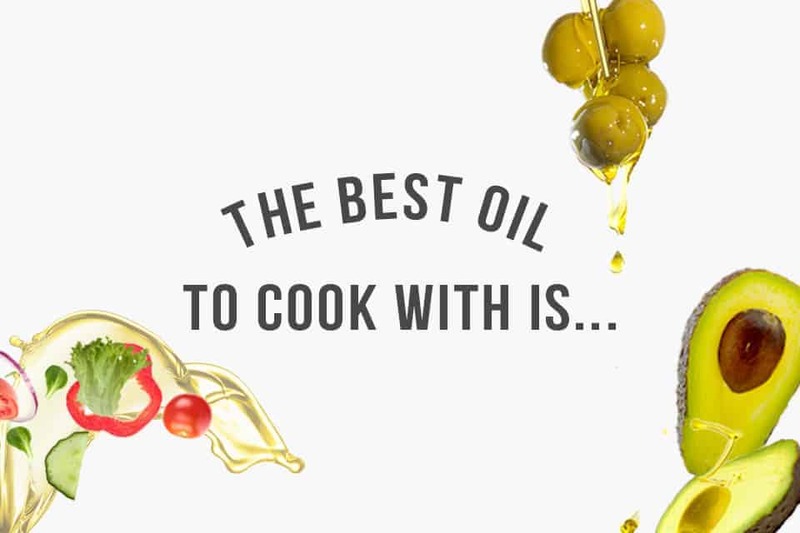 When you want to make healthy choices for your family – and cook a delicious meal – which oil should you choose? We break it down for you. Extra virgin olive oil tastes more like the oils it’s made from, and it has a lower smoke point so it is less versatile than regular or ‘light’ olive oil. 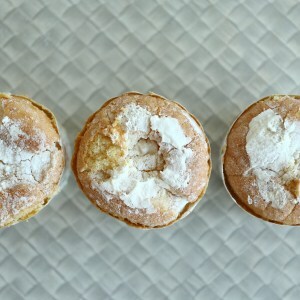 However, it’s of higher quality and is typically tastier. Use extra-virgin olive oil, which is unrefined, for dipping your breads and making dressings. 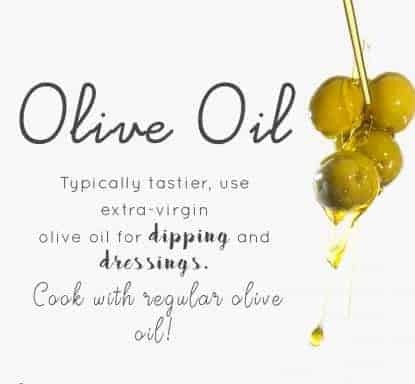 Cook with regular olive oil. 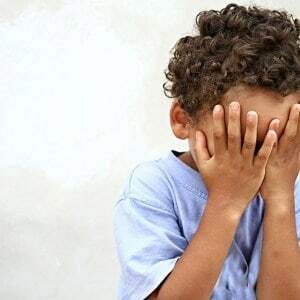 Check the ingredients carefully, as any plant-based oil can be labelled a vegetable oil. 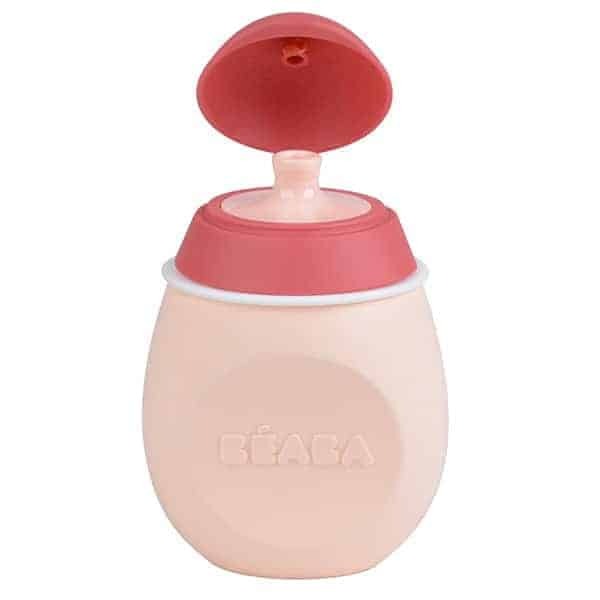 Most vegetable oils in the United States are either entirely or mostly made from soybeans. 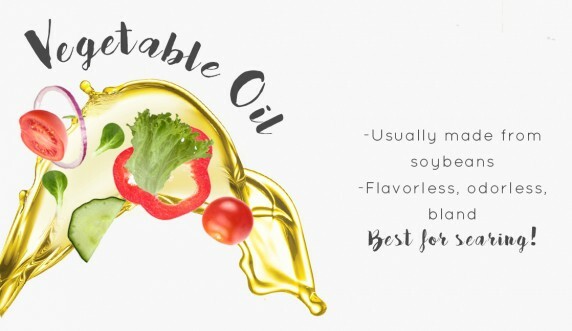 Generic ‘vegetable oil’ is flavorless, odorless, and basically as bland as you can get! Health benefits (or lack thereof) can vary, since each vegetable oil contains different amounts and types of vegetables. 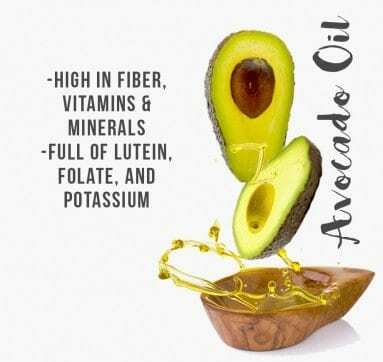 Avocado oil is flavorful and, like the fruit it’s derived from, is low in sugar and high in fiber, vitamins, and minerals such as lutein, folate, and potassium. While it is high in fat (14 grams! ), 9.9 of those grams are monounsaturated ‘healthy’ fats, and 1.9 grams are polyunsaturated fats. This oil is pricier, but a little goes a long way! Coconut oil has been touted as a panacea for every part of your body, from your hair to your heart. But while research has shown some benefits (less belly fat! ), experts say we need to do a bit more research. 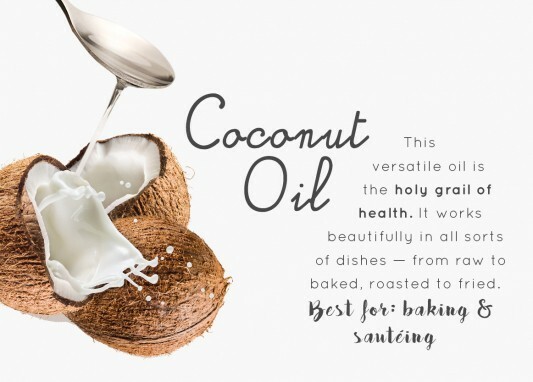 Most studies seem to back coconut oil’s superhero status, but the World Health Organization recommends limiting your intake of coconut oil, which is high in saturated fats. Corn oil is high in saturated fat and low in monounsaturated fat, making it one of the unhealthiest oils (and the oil most frequently used by fast food chains to make French fries). Stay away from this artery-clogging oil. Americans are eating more butter now than at any point in the last 40 years, and for good reason; recent research has found that saturated fat is less harmful than it was originally thought to be. The science is all over the board, but there’s no denying that butter is tasty! We recommend it when you need that full-fat flavor, but for most cooking, oils are likely the healthier option. 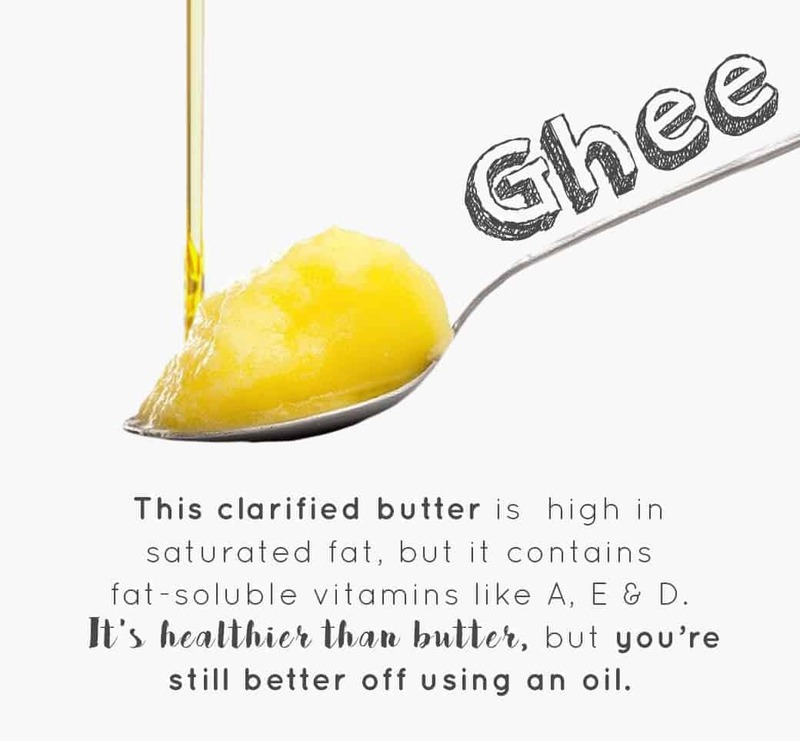 Ghee, or clarified butter, is made by extracting milk solids from butter to give it a higher smoke point. 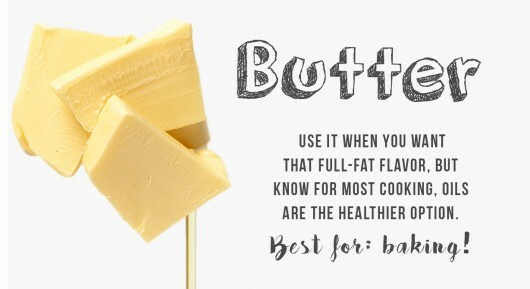 Like butter, it’s high in saturated fat, but it contains more fat-soluble vitamins like A, E, and D. It beats butter, but you’re better off with an oil. Grapeseed oil doesn’t have much flavor, and its smoke point is moderately high. 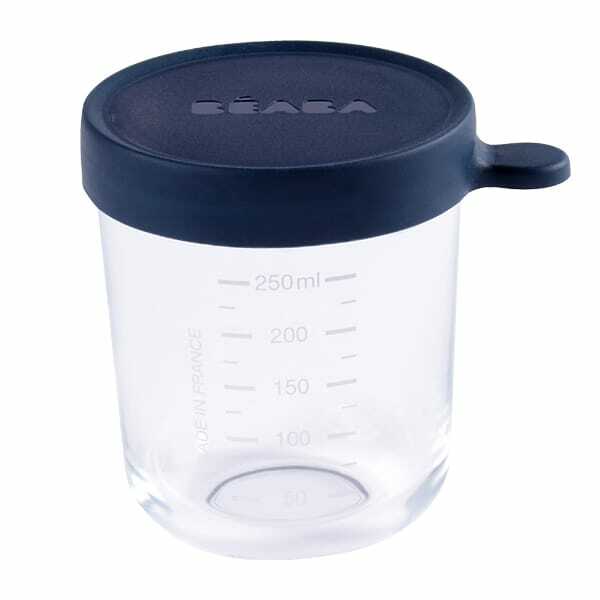 It can be good for baking and sautéing, but this isn’t something you’ll be deep frying with. Bon Appetit cites it as one of the three best cooking oils because it’s high in polyunsaturated fats and vitamin E. The downside? It’s expensive and most grocery stores don’t carry it. 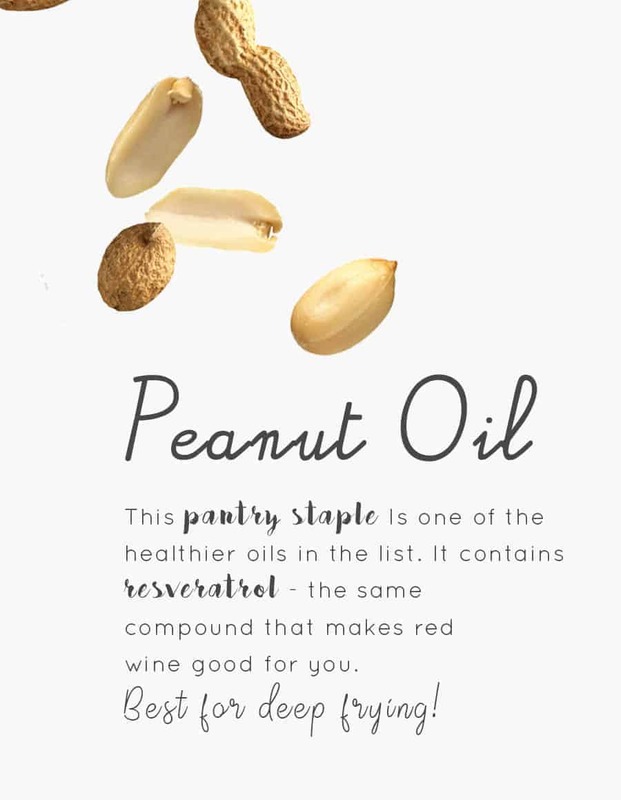 Peanut oil is high in ‘good’ monounsaturated fats and low in ‘bad’ saturated fats, so it’s one of the healthier oils on the list. It also contains resveratrol; that’s the same compound that makes red wine good for you. Resveratrol has been found to help prevent and treat cancer, heart disease, and even brain disorders. 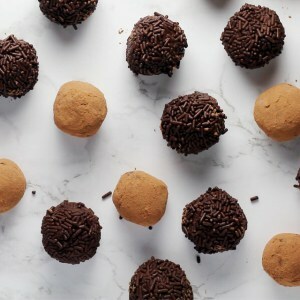 With a high smoke point and mild flavor, it’s a pantry staple (as long as you don’t have a peanut allergy, of course). Canola oil has one of the lowest amounts of saturated fat – just 7%, compared to 15% for olive oil. Canola oil has a fairly high smoke point and it isn’t too expensive. 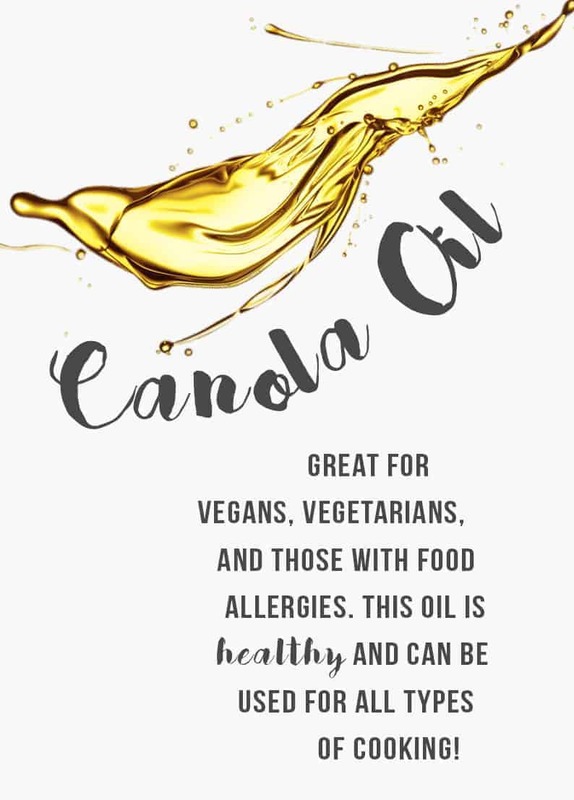 Great for vegans, vegetarians, and those with food allergies, canola oil is healthy and can be used for everything except searing. 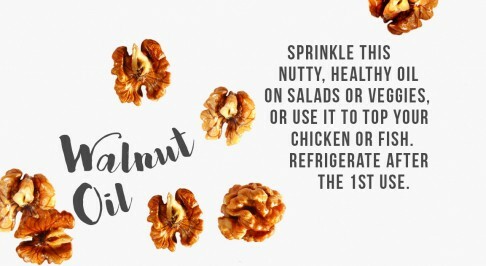 This nutty, healthful oil has many of the benefits of walnuts. 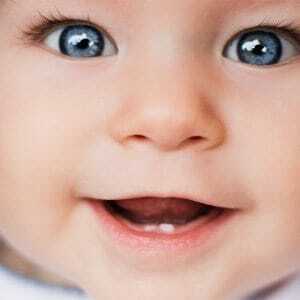 It’s been shown to lower triglycerides, which then reduces the risk of coronary heart disease. 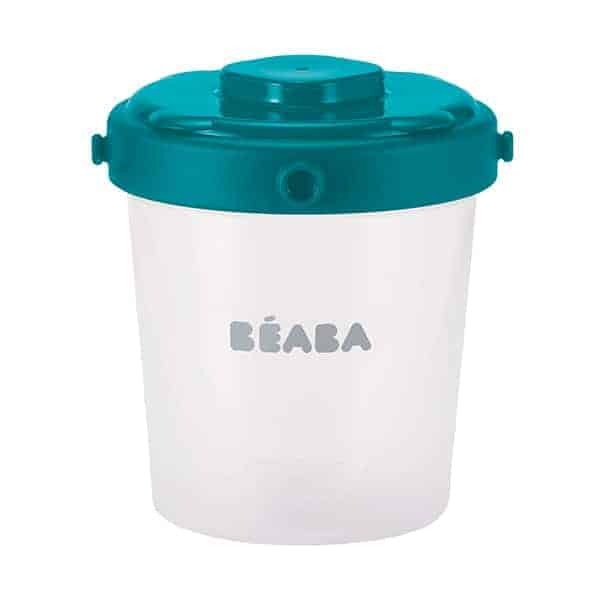 Sprinkle it on salads or vegetables, or use it to top your chicken or fish. Flavorful oils like walnut oil should be refrigerated after their first use. 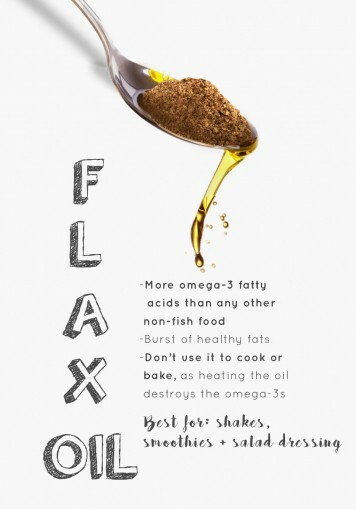 Flax oil provides more omega-3 fatty acids than any other non-fish food, but heating the oil destroys the omega-3s. 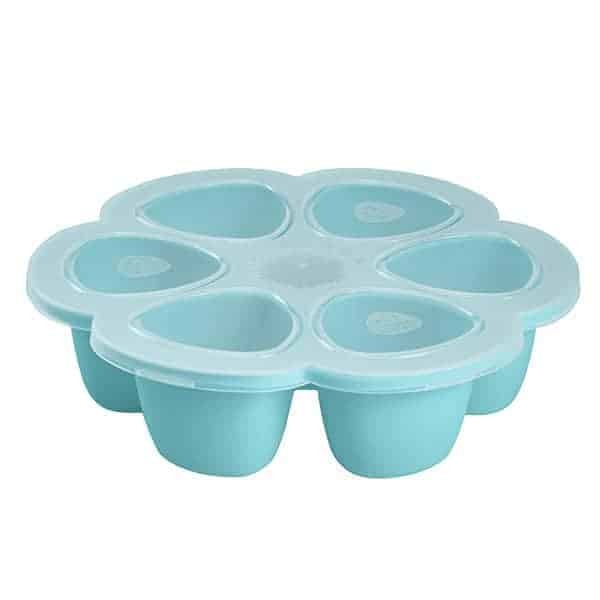 Add it to a smoothie or make a flax oil salad dressing for a burst of healthy fats, but don’t bother using it for cooking or baking. Side note: flax oil needs to be refrigerated! 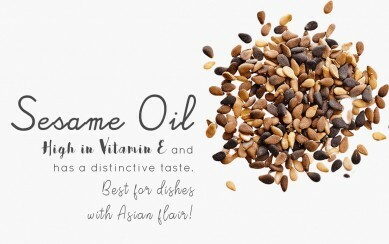 Sesame oil has a distinctive taste that pairs exceptionally well with traditional Asian dishes. If you’re making it in a wok, sesame oil is likely to brighten your dish and enhance the flavor of your meal. 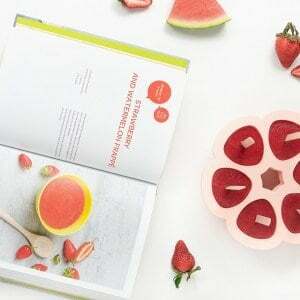 It’s also high in vitamin E, an antioxidant that helps bolster your immune system. I prefer extra virgin olive oil. 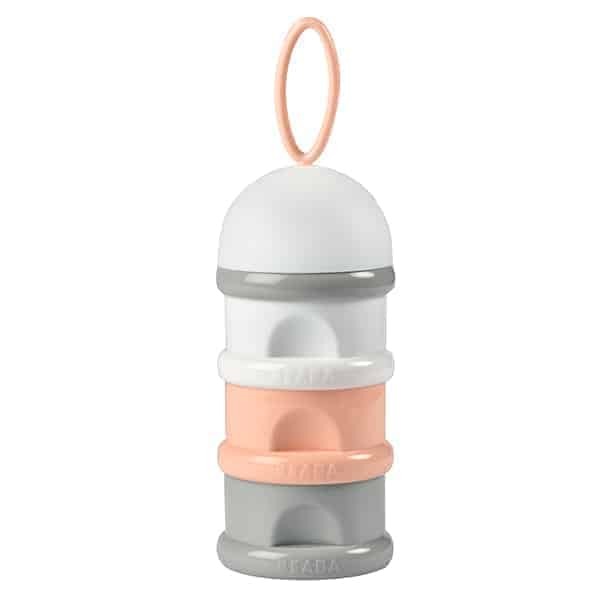 It tastes very good. But I would like to try the other healthy oils for cooking.